here is collection of pictures of Chris with some well-known people. 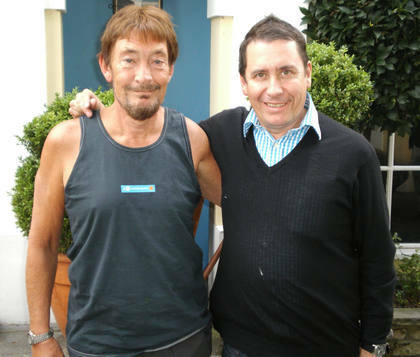 With Nick Mason, Pink Floyd drummer and big motor sports and vintage cars enthusiast. Motor Sport Hall of Fame Induction, London, 15.02.2011. With Eddie Jordan, 90's famous F1 driver. Motor Sport Hall of Fame Induction, London, 15.02.2011. With Sir Stirling Moss, 50's racing legend. Motor Sport Hall of Fame Induction, London, 15.02.2011. With F1 legends Eddie Irvine and Nigel Mansell, 12.02.2001 Grand Prix Charity Gala at the Royal Albert Hall, London and with Ralf Schumacher (extraction from a photo once published on this forum). Sorry for the picture size. With Stuart Epps, chief sound engineer of Espresso Logic. best regards and thanks everyone for any comments and better quality pics. Last edited by andrew fischer on 17 Apr 2014, 09:04, edited 2 times in total. Some i did see before, some aer new, great pictures again Andrey! 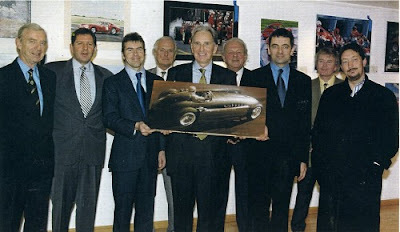 "1999 annual Grand Prix Sportique international motoring art competition. The jury with the winning painting, left to right: Tony Brooks, Jody Scheckter, Paul Stewart, David Mills, John Watson, Ken Reeds, Rowan Atkinson, Craig Warwick and Chris Rea." BTW, I now think picture with Jun Carlos Ferrigno is from the same year, i.e. 1999 not 1992. And 1 more note - in the starting post I misspelled Eddie Irvine for Eddie Jordan in the photo with Chris and Nigel Mansell. I do not know the date, looks like ca. 2009 to me. Maybe somebody knows more of it.